Villa Jardin is a two-level, box-type vacation residence located just 50 meters away from the white-sand beach of La Preneuse on the western coast of Mauritius. 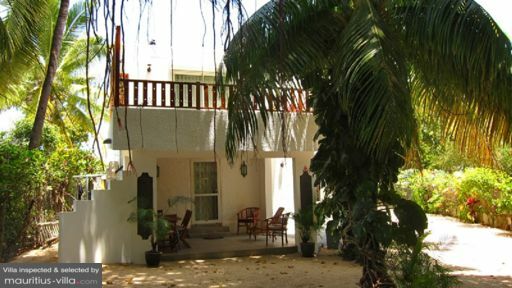 Ideal for small families, select groups of friends or double-dating couples, the villa has a homey and rustic ambience created by its predominantly woody and quaint appointments and interiors. With its comfortably laid-back character and charm, Villa Jardin truly exemplifies classic seaside holiday living. 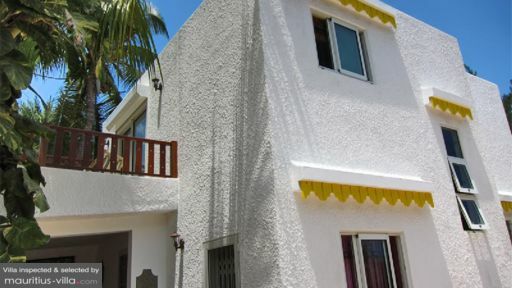 On the second level are the villa’s two bedrooms. Both have double beds and dedicated bathrooms. 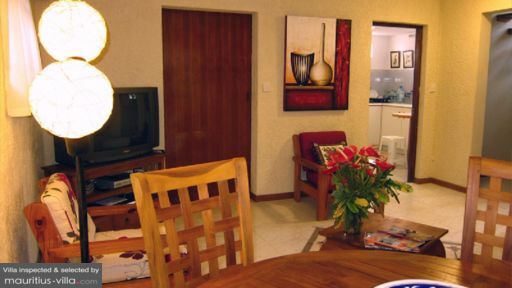 Both also open out to furnished balconies with views of either the garden or the ocean. The villa’s sandy outdoors lead to the shore through a pathway fringed by old, giant trees as well as thick bushes and shrubs. Extending from the villa is a covered terrace furnished with cushioned wooden chairs and a wooden dining table that can accommodate four. Here, you can all leisurely lounge under the shade especially in the late morning after a swim in the sea. Then hang around for a hearty lunch that can last till late afternoon just in time for your second dip. Back from the beach after dark, you can also dine alfresco especially on breezy evenings. The ground level of the villa is devoted mostly to the living area. On its cushioned, wooden chairs arranged around a widescreen TV, you can all get together for the much-awaited episode of the newest hit series. At one corner is the dining area with a round, wooden table and four beautifully crafted wooden chairs. Here, you can, one after the other, serve your respective specialties which you took turns preparing at the fully-equipped kitchen set up in a separate room. Daily housekeeping is done throughout the villa every morning – six days a week. Aside from La Preneuse beach, there are other attractions near Villa Jardin. Visit the Museum of La Tour Martello. Try out the Bay Restaurant and dine on the beach. Stop by the Ruisseau Créole Shopping Center and discover local finds. There are exhilarating aqua adventures you also must try. Swim with dolphins. Go kite surfing around the waters near Morne Mountain, surfing and stand up paddling at Tamarin Bay, or big game fishing at the Black River. You must also explore the fascinating terrain. Trek to the Black River Gorges, to Morne Mountain – a UNESCO World Heritage Site, to the Seven Cascades or waterfalls, and to the Terres of the Seven Colors. You can also embark on a wildlife safari. Play golf or go karting.